Paper Pleasing Ideas: Bitten By The Bug!! Honestly, I made 8 cards today. They would have probably been done a lot sooner, but with so many interruptions, I just finished! I used my stamp set, Encouraging Verses from All That Scraps. I left it the same size, but changed the color of some of the words (Tutorial Here). I made them the same color as Taken With Teal, since that is the color scheme I had in mind for my cards. I then duplicated it, and printed them off on a 8.5 X 11 sheet of white CS. Enough sentiments for 9 cards at the touch of a button! Here is the final eight. I used THIS TUTORIAL to ink up my embossing folders (I used 4 different ones) with teal on white CS, matting them on black. The 1 3/4 X 4 strip of teal was added on top, with faux piercing done on the bottom using a black marker and my trusty mat pack. I added the reversible satin ribbonalong the seam, and tied it in a knot. I attached my sentiments to the black that had the bottom edge scalloped. I used my 1/2 circle punch to make a half circle on the edge, and added it to the card with dimensionals. The clear dew drops were added with crystal effects. I think they turned out quite nicely. I am also making a holder for them right now, but that will be another post, since it is not quite done yet. Have fun and happy stamping!! Isn't this AWESOME ?!? I am so excited that it worked out so well. OK, I bought some Clear Pillow Boxes from All That Scraps. I was playing around with it and thought, "Hey, I wonder if this would work in a Cuttlebug folder?" IT DOES!! I used the heart folder and ran it through my Big Shot, and tada, and cute little Valentine's Day gifty. I made a sleeve insert, so you wouldn't be able to see what was on the inside, and then just decorated the outside. I used the 1" stitched chocolate ribbon and the sentiment is from Amy's Love Sentiments. The hearts are covered in Stardust Stickles, and the tag is tied on with some SPARKLAY WalMart ribbon. This pillow box is a great size, it can fit a whole chocolate bar inside. Course, I will eat the bar first and fill it with some type of junk food that I DON'T like...hehehe. Have fun and happy stamping!! I am on a Thank-You Card Kick! I had a photographer contact me about making the thank you cards for her clients to purchase. It needs to be simple, yet lovely, and have room for a picture inside. It also needs to be able to be mass produce in a hurry, I could have up to 100 at a time to make. This beauty IS NOT one for that line up. I was bored of making simple cards yesterday, and this took me out of the rut. The base is white, with a night of navy layer, and then vellum (paper weight) was embossed with my Textile Cuttlebug folder and attached with brads. I added the May Arts Metallic ribbon in Mauve (it looks gold) to bring some more accent color. I cut my white and navy layer panels, and stamped the flourishes(Frames With A flourish - Stampin' Up!) in the navy with white ink and embossed them with white. I centered a long rectangle nestie and cut it out. I used repositional adhesive on the back of this layer and stuck it to the white where I wanted the sentiment to be. 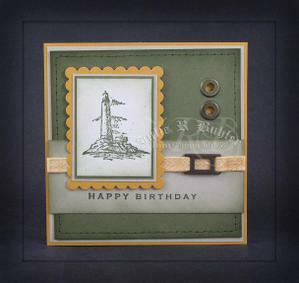 I stamped the sentiment with versamark, removed the navy layer, and embossed it in gold. Then I added the navy layer with dimensionals, and stuck the whole thing to the front of the card. I'll save this for my own stash, hope you like it. Have fun and happy stamping!! First off....WoooHooo, I am having so much fun! Ahem...secondly, I want to show you the difference between the New In Color Pirouette Pink and Pretty In Pink. I really am loving this new pink, it is so soft and airy. It also totally compliments pretty in pink, they go really well together. In fact, let me show you a card...hehehe. I stamped the image on a 3.5 X 3.5 card with black and then embossed a square (Tutorial Here) into it with my Nestabilities (from All That Scraps). I watercolored the flower with pirouette ink from the pad lid, and then shaded it with pretty in pink. The center or the flower was barely banana and shaded with summer sun. The leaves are the new kiwi kiss color. Yum, yum, these colors are awesome! I punched a pirouette butterfly with my new Martha Stewart punch and adhered just the body with 2 way glue. Finally, I used my Atyou Clear Glitter pento go between the 2 squares for some added umph. Hope you like my first attempt at a card with the new colors and set. Have fun, happy stamping, and come back for some more new schtuff !! I wanted to play along with the TLC (Technique) Challenge over at SCS today. I absolutely LOVE the effect of it, but have never tried it. So, I went to work, and came up with this. Isn't it cute ? I made a grid on a 4 X 4 piece of CC Designs White CS with my Scor-Pal !! YES, All That Scraps carries the Scor-Pal - it really is your one stop shop! I scored a border 1/4 all the way around, and then scored my grid every 1/2 inch on the diagonal inside. This was the matted on to some Bazzill CS from the Sweet Treats card kit. Yes, you guys bought her out, but no need to fret. Those that didn't get yours, put your name on the wait list and she will let you know the minute it is ready. You can also get them seperately, though, if you wish. So, I stamped the cute teddy on watercolor paper, and colored her with my SU reinkers. The ice cream is Liquid Applique again, I just couldn't stop myself. I think I am going to have to get the brown one next. I'm not really a strawberry ice cream fan. She was then cut out with the square Nestabilities and matted on the scallop CS that was also cut with the nesties. I matted the grid onto the base (from the kit) and added some DP and ribbon, both from the it, as well. I stamped the sentiment and attached the image with dimensionals (SU). Finally, I added a couple of the sugared brads that come in the kit. Yep, I have to try this technique again. It really adds a nice dimension to the card, without extra layers. Try it out, too cool, have fun and happy stamping!! I had to make 2 grad cards, so I figured I'd do another Sketch Flip. Their schools, though different, both had the same colors, so it made it easier to flip them! So, here is the sketch and the first card. The colors are black, real red and white. I ran the white layer through my Cuttlebug with the Textile Embossing Folder, both from All That Scraps. This was matted on red and black and then a strip of red CS was the glued on top of that. The stamp is a retired SAB set, and I inked it up with red and garden green SU markers. I stamped them off before putting it on the white, and then added the sentiment over the top. I cut it out with my Coluzzle (SU), and then used my Giga Scallop Circlepunch for the scallop black edge. If you don't have this punch, you can follow this TUTORIAL or VIDEOfor the same effect. I then glued them together, and added some white gel pen dots in the scallops. I glued this to the card, and used the mat pack (SU) for the placement of the brads on the bottom. Now here is the flipped card. The only difference with this one is on the inside. I made this a pocket card, since I needed it for cash...Seriously, which grad doesn't like THAT ?!? I hope you enjoy this sketch flip and if you try it out, be sure to use the keyword JSF02 on SCS when you upload it. That way I can go check out what you have done with it. Have fun and happy stamping!! I put another video together, this time to show you the way to cut with the Nesties. After the video, make sure you scroll to the bottom of the post. I have added a picture howing you how I store my Nesties for easy access. I went to Staples and got myself some magnetic tape. I put it into my DVD tin - yet another use - and laid them on top. They stuck down perfectly! I put all the scallops in one case, and the plain rectangles in another. Now, I will not save that I am the first one to store them this way. I have seen many different ideas on storage for them, but this is what I figured worked best for me. Is this not the best image EVAH!! This is one of the girl from another new set being released on May 4th over at All That Scraps called Glam Girlz. This girl is Shari, and I am loving that bling on her finger. I colored her in with markers, but paper pieced her shirt and pants with Basic Grey DP. I cut her out with my Nesties, run through the Cuttlebug, and matted it on bravo burgundy that was cut with the scallop die. I left the die on to sponge the BG around her pink. 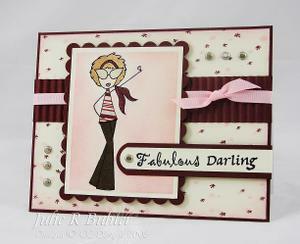 The BG is stamped with an image in the set with pretty in pink and burgundy, and the edges sponged with the pink. This was matted on the burgundy and then I added the crimped layer, tying the pink grosgrain over it. There are 4 sentiments in the set that are separate, but can be put together to form your saying, and I stamped 2 of them in black on vanilla. I rounded the end with my 1/2 circle punch, and then did the same with the 3/4 circle to the burgundy mat, adding the brad. I added my image to the card with dimensionals, and then the sentiment with dimensionals, as well. I used my mat pack to get the placement for the other brads. I wanted to tie in the silver brads, so I colored her bling and her shades with my Sakura Stardust gel pen. Stick around to meet her friends, Gwenny and Frankie, coming in the next couple of days. Make sure to go to the ATS Blog to win this set. Have fun and happy stamping!! This card was also made for the Featured Stamper challenge on SCS. I chose to CASE THIS CARD from sparklegirl. She had originally used Beate layout, so I switched it up. I also did faux stitching and lost a few layers to make mine different from hers. I cut out the mustard with the Nestie in my Cuttlebug , and both are available from All That Scraps. I then layered on the sahara, and artichoke. I stamped the image from Winds Of Grace in artichoke on confetti white, and then sponged the edges in the same color. I cut my artichoke out, sponged it and added the faux stitching with my mat pack and artichoke marker. I matted it on sahara and then added the jumbo eyelets, with my crop-a-dile. I cut a piece of sahara, sponged it with the artichoke and stamped the sentiment on it (It's Your Birthday). I ran some twill tape through my mustard ink, and set it with my heat tool. I added a buckle from my Aged Copper hodge podge kit, and used sticky strip to adhere it to the layer. This was then added to the artichoke, and all of it was matted to the mustard base, which measures 5.5 X 5.5. The only thing left to do was add my image panel, and I did that with dimensionals. Feel free to play along! If you upload your photo to SCS, be sure to use the keyword JCC11. If you put it on your blog, link it back here so I can check it out. If you are done before Saturday, you will be included in the draw to receive a card from me!